Paris. Beijing. Oslo. Québec. Jakarta. Dublin. The street scenes vary, but cities worldwide share the imperative to improve the efficiency, costs, and operations of their street lights. Echelon outdoor lighting control solutions are helping these cities, and others, do more with their strategic but costly lighting assets. It’s estimated that as much as 40% of city energy budgets are spent on outdoor lighting, and that a single street light can emit 200 kg of CO2 each year. Increasingly, cities need to save energy or do more with less energy, reduce carbon emissions, lower operating and maintenance costs, and comply with tighter government regulations. In addition, many are exploring Smart City applications and the use of lighting to boost safety for both drivers and pedestrians. For all these reasons, better lighting and lighting control top most cities’ priority lists. Echelon’s comprehensive, open standards-based approach to adaptive outdoor lighting control, which builds on Echelon’s status as the world’s leading control networking platform provider, delivers the cost and energy savings, proven reliability, and industrial scale to meet the most ambitious outdoor lighting goals. 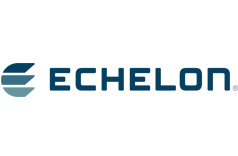 More recently, Echelon has pioneered hybrid wired/wireless network products that enable cities to mix and match their communications media. For instance, cities can use wired power line communications (PLC) for tunnels or remote stretches of highway and wireless radio frequency (RF) where wired solutions are cost-prohibitive. In this way, cities can for the first time achieve 100% lighting coverage with a single solution. Echelon’s lighting control products include the SmartServer 2.0 Controller, a segment controller with PLC and RF border routing, CRD 3000 RF-PLC street light bridge, CPD 3000 PLC (wired) light point controller, CPD 4000 RF (wireless) light point controller, and Central Management Software (CMS)-enabled client and server software.